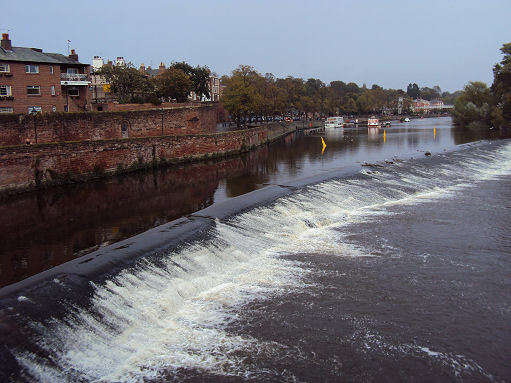 Known to the Romans by the name of Castra Deva, meaning "the military camp on the River Dee", Chester began life as a fort occupied by the 20th Legion (Valeria Victrix). The original fort on the River Dee was probably established during the early campaigns of governor Publius Ostorius Scapula against the Deceangi in north-east Wales sometime around AD47/48, during the Roman advance northwards. For more than three centuries Chester was one of the most important military bases in the Roman Empire. The fortress defences originally began as a ditch, known as a fossa, and an embankment, or an agger, with a wooden palisade for defence. These wooden defences were eventually replaced by a solid stone wall and towers. On the 25th of May 1748 an inscribed Roman stone was discovered to the east of Newgate Street referring to the construction of part of the wall. The stone is now on display in the Grosvenor museum, its inscription is translated from the Latin as "The century of Ocratius Maximus, in the first cohort of the legion, built this piece of wall". The fortress took the shape of a playing card, (the usual Roman plan), rectangular with rounded corners, with defensive angle towers and interval towers, the remains of one of these angle towers can still be seen today by Newgate at the city walls. 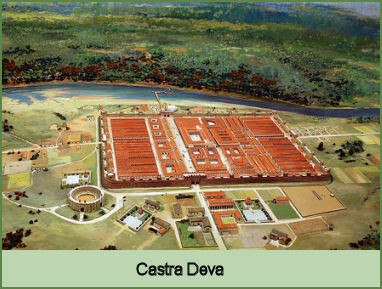 The fortress of Castra Deva was the largest in Britain, covering sixty acres and had four entrances, one at each side. The main road ran east to west and was known to the Romans as the 'via principalis', this became the modern Eastgate. The fort's east entrance has a double archway with a statue of the god Mars in the middle. (A Roman arch was discovered during the demolition of the old Eastgate in 1767). The Roman grid of streets centered on the spot where the Chester Cross is now situated. The principia, or headquarters building, was the most important and impressive building within the fortress. A large courtyard was was surrounded by offices and stores. Behind the courtyard stood a great hall which was known as the basilica. A civilian settlement gradually grew up around the fort, probably originating from trade with the fortress. The fortress was garrisoned by the legion until at least the late fourth century. Although the army had abandoned the fortress by 410 when the Romans retreated from Britain, the Romano-British civilian settlement continued. King Arthur, the legendary leader of British resistance against the Anglo-Saxons, is reputed to have fought his ninth battle at the city of the legions (Chester) Another historic figure of the period, St Augustine, visited Chester in his attempt to unite the church and held his synod with the Welsh Bishops. The Battle of Chester, which occurred around 615 or 616, was a major victory for the Anglo-Saxons over the native British. Æthelfrith of King of Northumbria annihilated a combined force from the Welsh kingdoms of Powys, Rhôs and possibly Mercia near the city. It resulted in the deaths of Welsh leaders Selyf Sarffgadau of Powys and Cadwal Crysban of Rhôs. The Saxons gave Chester its name. They called any group of Roman buildings a ceaster. In time this was corrupted to Chester. In the late 7th century, The Saxon princess, Saint Werburgh founded a religious institution on the site of the present day St John's Church which was later to become the first cathedral. 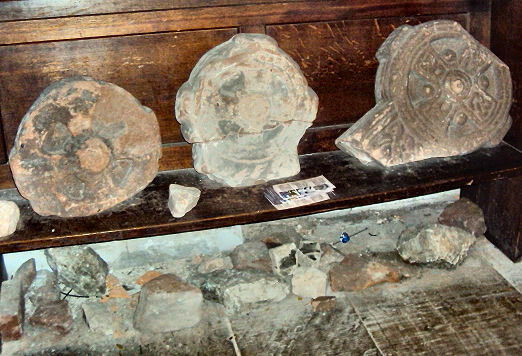 Her body was removed from Hanbury in Staffordshire in the 9th century and, in order to save its desecration by Danish marauders, she was reburied in the Abbey of SS Peter & Paul in Chester (the present cathedral). Her name is still remembered in St Werburgh's Street which passes alongside the cathedral. The Roman city walls were repaired and extended in Saxon times to provide protection from the Vikings. The Vikings occupied Chester for a short time until Alfred the Great laid waste the land surrounding the city to expel them. Alfred's daughter Ethelfleda, Lady of the Mercia, built the new Saxon 'burh'. Bonewaldesthorne's Tower, on the city walls, is rumoured to have been so named after an officer in the army of Ethelfleda, she rebuilt Chester's walls during Saxon times around 907 A.D. extending them to the edge of the river on the South and Western sides of the old Roman fortress, to establish Chester at the centre of a line of burghs, stretching from Rhuddlan in North Wales to Manchester, to protect the northern frontier of the tribal kingdom of Mercia. The Anglo Saxon Chronicle records that in 973, Alfred's descendant, King Edgar,visited Chester where he held court in a palace (which stood in the area now known as Edgar's field) He was rowed a short distance up the River Dee by 6 sub- kings who included Kenneth, King of the Scots and Malcolm, king of the Cumbria. After which the kings swore fealty and allegiance to him. After the Norman Conquest of 1066, which was followed by the the harrying of the north, the Normans took Chester, destroying around 200 houses in the city. Hugh d'Avranches, William the Conqueror's nephew, was appointed Chester's first Norman earl. He was known by the nickname of le Gros (the Fat), he would also acquire the nickname Lupus (the Wolf) for his savage ferocity against the Welsh. 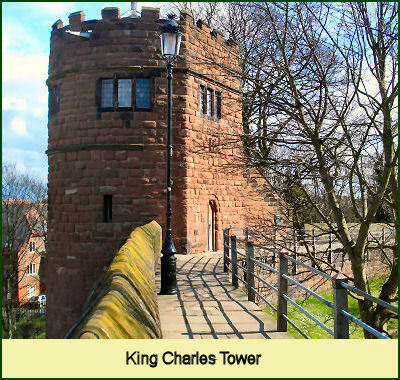 He built a motte and bailey castle near the River Dee, later to become Chester Castle. Hugh was also responsible for building the weir above the Old Dee Bridge between 1077 and 1101 (see image left) to hold water for his river mills. Hugh had endowed a Benedictine monastery dedicated to Saint Werburgh in 1092. The monastery was dissolved under King Henry VIII in 1540 and was rededicated to Christ and the Blessed Virgin Mary to become Chester Cathedral. Hugh's son Richard inherited his estates at the young age of seven but was drowned in the tradgedy White Ship, along with Henry I's heir, William, while sailing to England from Normandy. The title then passed to Hugh's nephew, Ranulph I, who converted the Wirral farmlands into a hunting forest. Ranulph fought in Normandy for the Conqueror's son, King Henry I, and served as a kind of semi-independent governor in the far north-west of England. He was suceeded as Earl of Chester by his son Ranulf II, who fought on the side of Henry I's daughter Matilda in the civil war of Stephen and Matilda. From 1301 the title Earl of Chester was held by the monarch's oldest son. Chester's port flourished during the Middle Ages. In 1195 a monk, Lucian, wrote 'ships from Aquitaine, Spain, Ireland and Germany unload their cargoes of wine and other merchandise'. During the 13th century Chester was famous for its fur trade and even by the mid-16th century the port was importing large amounts of fur and skins. However the Dee Estuary was slowly silting up so that trading ships to the port of Chester had to harbour downstream at Neston, Parkgate, and Hoylake on the Wirral. The Three Old Arches, at 48 Bridge Street, which incorporate part of the famous Chester Rows, survive from the thirteenth century. The stone frontage at the street and row levels is considered to be the oldest surviving shop frontage in England. Some of the buildings on the unique Chester Rows still retain their medieval undercrofts. The Stuart King Charles I visited Chester in 1642 and ensured the election of pro-royalist mayor, William Ince. In March 1643, leading Chester royalist Francis Gamull was commissioned to raise a regiment of foot to defend the city and outer defences, consisting of earthworks, were constructed. Parliamentary forces began to lay siege to the city. On 20th September 1645, parliamentary forces captured the east suburbs of the city up to the walls. They then began to construct cannon batteries within range of the city. A cannon battery placed in St John's churchyard breached the city walls near the Roman amphitheatre. A hole some 25 feet wide was made in the wall. Following the breach an attempt was made to storm the city, but the defenders repelled the charge. Repairs made to this breach in the wall are still visible to the present day, in the section next to the Roman Gardens. King Charles I entered Chester on 23rd of September, 1645, accompanied by around 600 men. The same day, Sydenham Poyntz, a Parliamentarian in pursuit of the King's forces, entered Whitchurch with 3,000 horse. The resulting Battle of Rowton Heath was fought on 24th September 1645 the battle took place around two miles to the south east of Chester. The battle started in the early morning and lasted throughout the day in three stages as Royalists were pushed back towards the city and its walls. In the afternoon, reserve troops were dispatched through the Northgate in support of the Royalists but by this time the battle was already lost. As the fighting reached the suburbs it was watched by the King Charles I and Sir Francis Gamull from the Phoenix Tower, now known as King Charles' Tower. The King quickly withdrew for greater safety to the Cathedral tower. The battle cost the lives of 600 Royalists and an unknown number of Parliamentarians. Among the Royalist dead was Lord Bernard Stuart (1622-1645) Earl of Lichfield, the king's cousin. The king managed to slip out of Chester the following day and crossed the Old Dee Bridge on route to Denbigh. The city surrendered to Parliament in 1646. The port of Chester declined seriously from 1762 onwards. By 1840 it could no longer effectively compete with Liverpool as a port. In the Georgian era, Chester became a centre of affluence, a town with elegant terraces where the landed aristocracy lived. This trend continued into the Industrial Revolution, when the city was populated with the upper classes in fleeing to a safe distance from the industrial sprawls of Manchester and Liverpool. On 1st August 1848 the Chester General Railway Station opened. It is one of only 22 listed railway stations in England.The new railways enabled Victorians to travel and Victorian leisure boomed with popular holiday destinations in North Wales and Blackpool. The familiar landmark of the Eastgate clock was also built in Victorian times, to celebrate the diamond jubilee of Queen Victoria. The clock was formally unveiled on 27 May 1899, the 80th birthday of Queen.